"One does not expect much of a gyros buffet, other than well-done meat and fresh pita. 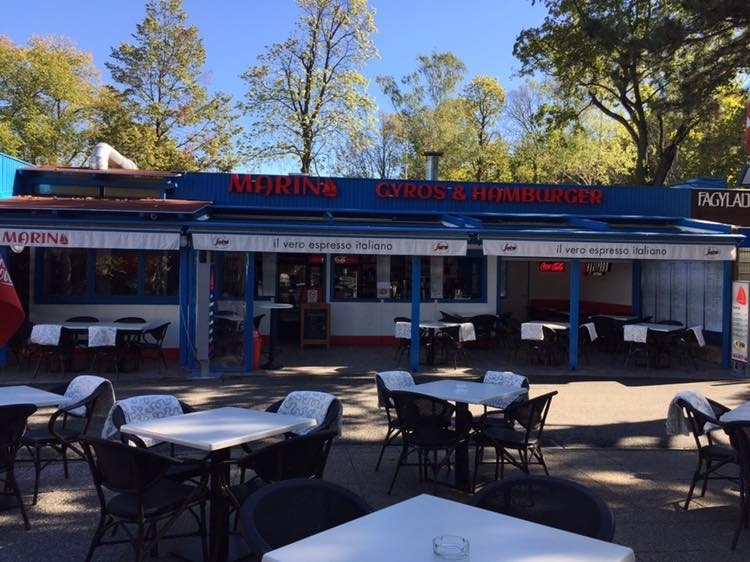 Still, the Marina Gyros & Hamburger, located in the "bazaar" of the Balatonföldvár porthas managed to earn a reputation similar to elegant bars and resturants. The Marina is a true "haunt"; its garden chairs are usually occupied by local sailors. The secret perhaps lies in the fact that in the vicinity of the port the Marina is the best place for lounging. Pub-Lik is too far, and the Csigaház on the other opposite of the boat stop, though also popular, is more suitable for dining. The small square on which Marina stands is a delightful meeting point of the Balatonföldvár lakeside. Another reason for its popularity is that the Marina is quite a good buffet. In fact, it does not pretend to be more. Do not look for artisanal hamburgers and other trendy gastronomical pleasures. The food is all right, the portion of their gyros plates is legendary, they serve Konyári wine, and the prices are reasonable."